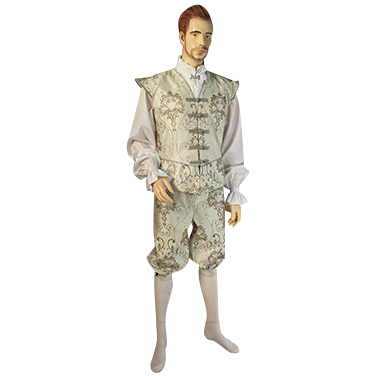 The Mens Renaissance Doublet is a beautifully handcrafted Baroque-inspired noblemans jacket made from elegantly patterned silver colored brocade. 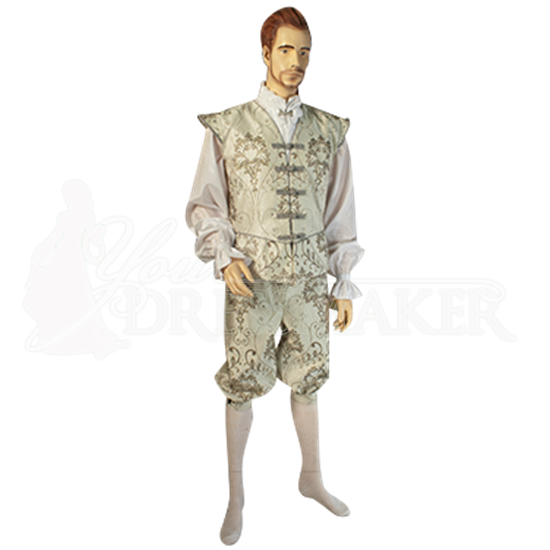 Wear this incredibly stylish doublet for the most regal of reenactment looks. The elegant patterns of the brocade are detailed with silvery thread, lending this doublet a princely appearance. Intended to be worn over a long sleeve shirt, the Mens Renaissance Doublet features short cap sleeves and a series of stylish front closures along the chest. The pants shown here are sold separately, so be sure to combine this piece with an item like the Mens Renaissance Pants (MCI-389) for a sophisticated, matching look.